No matter where I am, someone is always asking for a bottle opener. Home, the beach, a party ... me, recently, in the car. I'm serious about that last one. I bought a cold coffee that came in a bottle that required a bottle opener. So I asked Pete for one. Luckily, he had one on his keys. But I feel like no matter how many bottle openers we have, we could always use another. 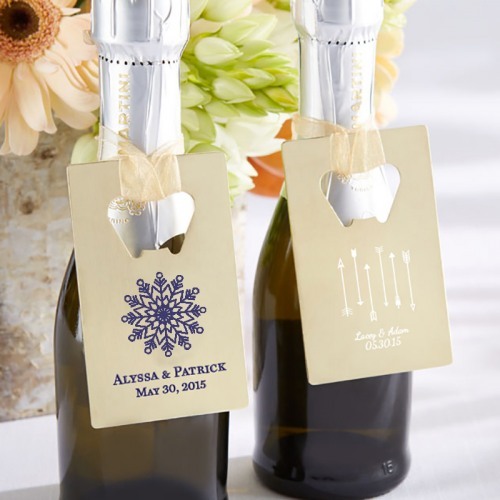 That's why I think bottle opener wedding favors are the perfect idea for your wedding. Plus, there are so many options that no matter what your theme, you can find a bottle opener that fits. I love these personalized credit card bottle opener favors. While the example is nice and attaches them to a bottle, you don't have to do that. Just lying these flat at each seat is nice enough. I love that they are the size of a credit card, which means your guests can keep them in their wallets at all time. Super useful. Actually, we were at the beach last weekend and the bottle opener on our cooler broke. So Pete's brother-in-law actually pulled one of these from his wallet. It was great. There are a ton of designs to personalize them with, plus you can choose either silver or gold. You can add your text to them as well. I'm in love with metallics and glitter right now. If we were having our wedding this year, I would absolutely incorporate them. Which is funny because I spent most of my life despising glitter. I think it was because I hated finding sparklers a week later. You never can clean up all of them, can you? But, back to glitter love. 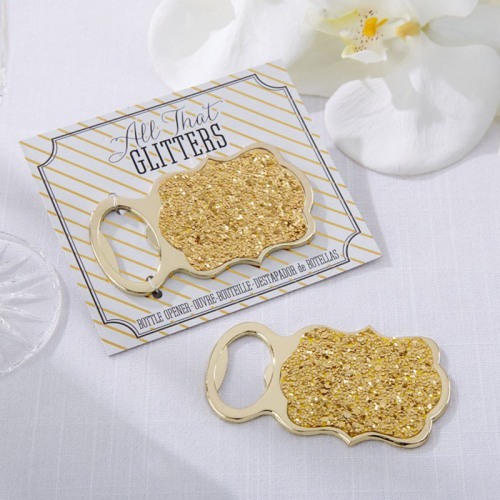 Since I love it right now, of course, I absolutely love this glitter bottle opener. 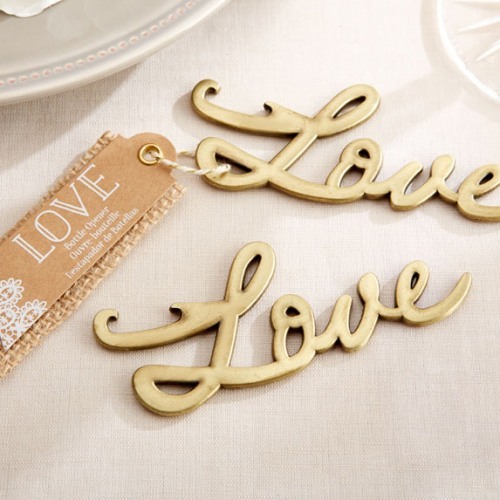 This only comes in gold, so be sure to add a few gold elements to your wedding if you're planning on giving these out. That will tie everything together. We had a destination-ish wedding. It was a destination wedding for everyone but us. Since almost our entire guest list was traveling from New York to North Carolina for our wedding, I almost picked up these flip flop bottle openers as a wedding favors. 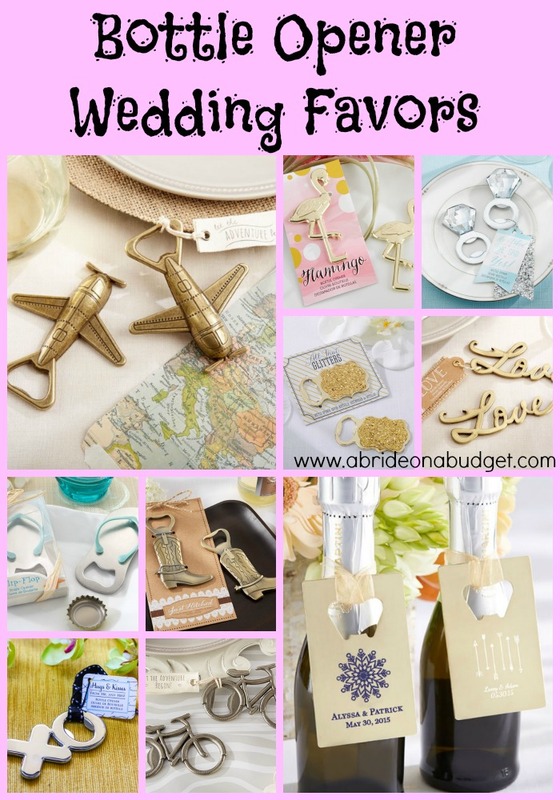 I ended up not, only because the favors at my bridal shower were flip flop luggage tags. 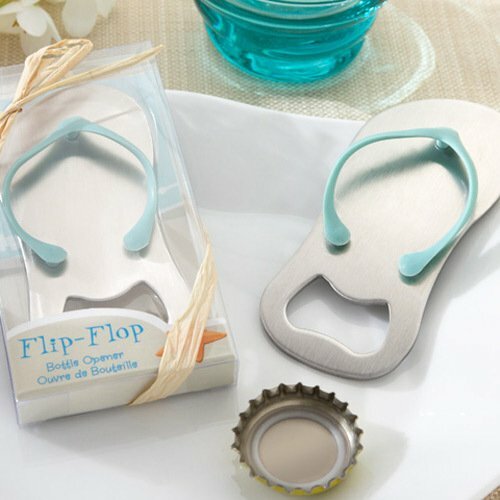 If you have different shower favors, and you're planning a beach or destination wedding, these flip flop bottle openers are a great wedding favor idea. 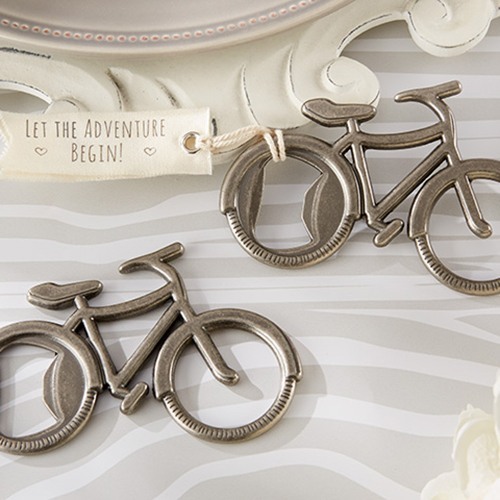 Love is a bicycle built for two ... or a bicycle bottle opener built for one. Personally, I'm a terrible bike rider. I actually can't ride a bike in a straight line all that very well. And it is basically impossible for me to ride it up a hill. Pushing works for me. But I got a bike for my birthday a few years back because Pete loves bike riding and I love him. So, even though I'm not entering the Tour de France anytime soon, I'm still so drawn to these bottle openers. They're so cute. If you can bike, you should pick them up. It actually took me a few seconds to realized that this "Love" Bottle Opener was actually a bottle opener. Good thing it comes with a tag. That's perfect, though, because your guests can leave it out on their bars, and it looks more like a decoration than a bottle opener. If you like this, but don't like the word love, you can get a very similar cheers bottle opener instead. Hugs and kisses from the Mr. and Misses. That's what this "XO" Hugs & Kisses Bottle Opener says, both literally and figuratively. Although, if you flip it around, it says OX. Hey, maybe if you have a farm wedding this is the way to go. It'll be a double favor. And if you do have a farm wedding, you can always make my cow centerpiece. We live in the south now, home of cowboy boots and dresses. 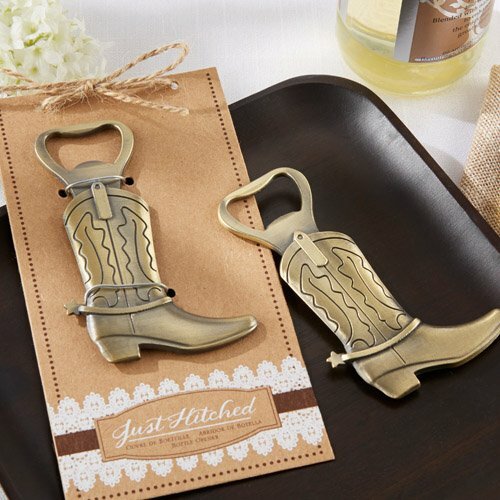 If you're a fan of the style, or just live in the south too, check out these Cowboy Boot Bottle Openers. I absolutely love all the details on it. It looks just like a cowboy boot. It's cute for a barnyard, rustic wedding, or a Western wedding. Take a break from thinking about weddings for a minute and think about your engagement party. 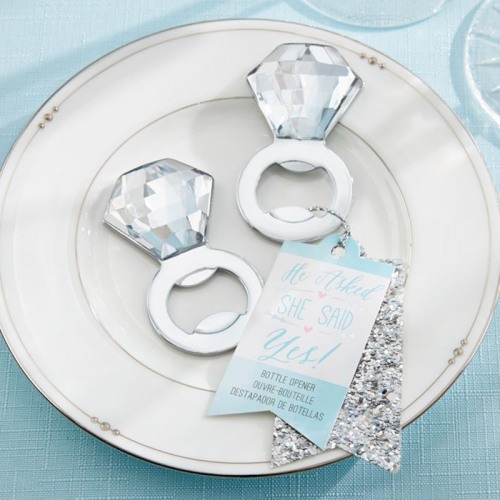 You absolutely should give out these Diamond Ring Bottle Openers as favors. I love them. They're just this big bling of a favor. So much fun. 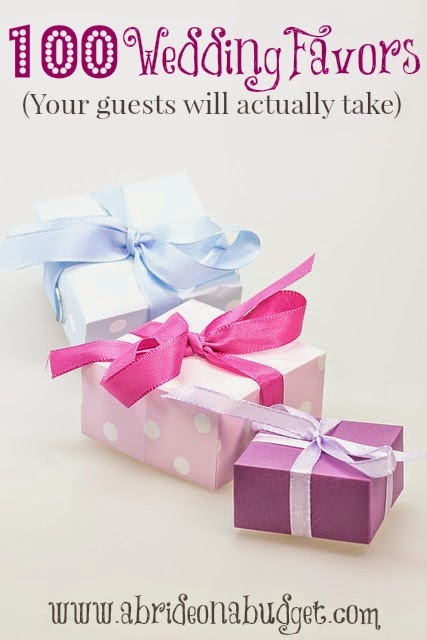 They would work for a bridal shower too, in case you don't have an engagement party. 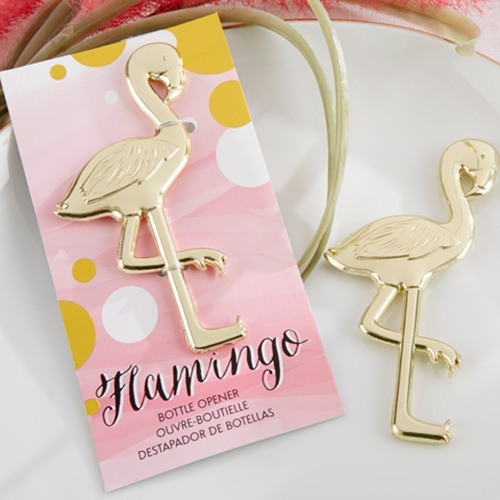 The first two times we went to Las Vegas, we stayed at the Flamingo hotel, so these flamingo bottle openers have a soft spot in my heart. I absolutely love it. I like that it's metallic too and on a pink sheet of paper instead of being pink itself. It's classier that way. And these are pretty feminine too, which is nice because most of the bottle openers I see are pretty masculine. I saved my favorite for last. 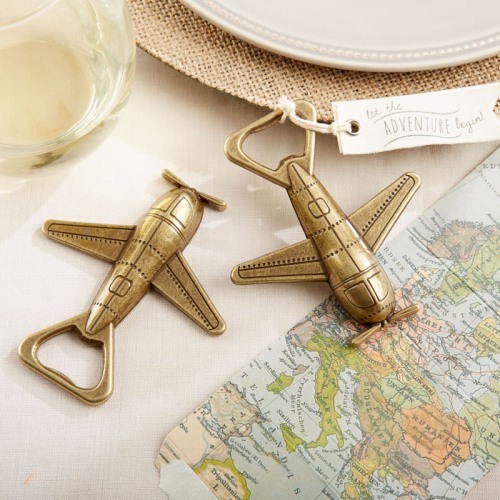 I love love love this airplane bottle opener. It's perfect for a destination wedding or a travel-themed wedding. And the fabric gift tag that says "let the adventure begin" is so perfect. I absolutely love these (and sort of wish I had an excuse to have a party so I could give them out). BRIDAL BABBLE: Which of these bottle opener wedding favors is your favorite? Want more wedding favor ideas?